An outgrowth of the Civil War, the gunfighter era also spawned a number of outlaws. With men who had become accustomed to violence and often having lost their lands or fortunes, being quick with a gun was often an easy transition. Though about a third of the gunman died of “natural causes,” many died violently in gunfights, lynchings, or legal executions. The average age of death was about 35. However, of those gunman who used their skills on the side of the law, they would persistently live longer lives than those that lived a life of crime. The occupations of gunfighters ranged from lawmen, to cowboys, ranchers, gamblers, farmers, teamsters, bounty hunters, and outlaws. During these violent days, most of the shootings occurred in Texas, Kansas, New Mexico, Oklahoma, California, Missouri, and Colorado. Jeff Ake – A gunfighter during the Texas Reconstruction, he claimed to have known all of the bad men of the times including John Wesley Hardin, Jesse James, Cole Younger, Bill Doolin, Sam Bass, and Ben Thompson. William Ake – Brother to Jeff Ake, William was a gunfighter who fought in the Mason County War in Texas from 1874 to 1876. Bill Allen – A member of Jesse Evans Gang during New Mexico’s Lincoln County War. Nothing is known of life following the conflict. Billy “The Kid” Allen – A gunfighter in Deadwood, South Dakota and New Mexico that killed several men. Frank Allen (18? ?-1881) – A gunfighter, Allen was shot and killed in EI Paso, Texas in March 1881. John Allen – A gunman and gambler, Allen had been in Dodge City, Kansas prior to making his way to Trinidad, Colorado. There, he ran into an “old” Dodge City acquaintance and gambler, Frank Loving. Allegedly the two had been arguing for some time over loans the two had made to each other. On April 16, 1882, their argument came to a head in what is known as the Trinidad, Colorado Shoot-out, in which Allen shot and killed Loving. Charged with murder, John Allen was tried in September, but was found not guilty and walked away a free man. Later he headed back to Dodge City and eventually became a street preacher and traveling evangelist. 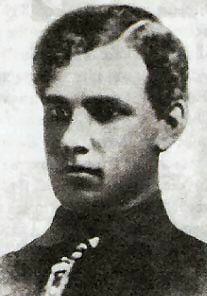 Joseph Allen (18? 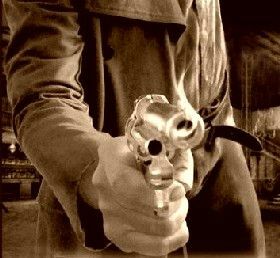 ?-1909) – A gunfighter who was involved in a bitter feud in Ada, Oklahoma, was later arrested for the murder of Gus Bobbitt. On April 19, 1909 a vigilante mob of 150-200 men stormed the jail, and dragged out Allen, along with Jim Miller, Jesse West, and D.B. Burrell. The four were hanged in an abandoned barn behind the jail. Robert A. “Clay” Allison (1840-1877) – Allison was said to have killed at least fifteen men, moving between Colorado, New Mexico, and Texas. He was killed near Pecos, Texas when he was run over by his own wagon on July 1, 1887. Perry Altman – A New Mexico gunfighter and half-brother of Oliver Lee. Ham Anderson (18? ?-1874) – A gunfighter and cousin of John Wesley Hardin, he was involved in a number gunfights in Kansas and Texas before he was finally killed in 1874. Hugh Anderson (18? ?- 1873) – A Bell County, Texas cowboy, Anderson was involved in the Hide Park Gunfight in Newton, Kansas in 1871. In the skirmish, Anderson killed Mike McCluskie and, he himself, was wounded. Two years later, Arthur McCluskie, Mike’s brother, caught up with Anderson and in a brutal duel, both men died. Reese Anderson – A cowboy and vigilante, Anderson worked for the Granville Stuart Ranch in Montana during a time when the area was rampant with cattle rustlers and bandits. In 1884, Grantville formed a vigilante group, known afterward as “Stuart’s Stranglers,” and Anderson became its leader. Within just weeks, Anderson led a group of some two dozen volunteers to track down the many outlaws hiding out in the area between the Musselshell and Judith Rivers. In the end, they caught and hanged some 23 men that they caught red-handed with stolen cattle or horses. Scott L. Anderson – Gunman and stage guard working in South Dakota, Anderson fended off a number of hold-up attempts. Tom Anderson – A gunfighter, Anderson was the brother of William “Black Jack” Christian. William Anderson – Anderson was a drunken gunman who lived in a Delano, Kansas, a small town just outside of Wichita. His excessive drinking and tendency towards gunplay had him constantly at odds with the law. In the spring of 1873, Anderson and several other men were involved in an argument in a Wichita livery stable. Within no time, the confrontation turned to gunplay and one of Anderson’s shots went wild, killing an innocent man just passing by. Though Anderson was arrested, he was later released when the death was ruled accidental. Several months later on October 27, 1873, Anderson was in “Rowdy Joe” Lowe’s saloon when Edward “Red” Beard, who owned a saloon next door, burst into the bar with his guns blazing. Beard had argued with one of the “ladies” in his own saloon when she fled into Lowe’s place. Instead of hitting his intended target, Beard shot one of Lowe’s “girls.” Lowe then grabbed his shotgun and began to fire at Beard, who staggered outside. As the bullets were flying, Anderson got caught in the crossfire, taking a load of buckshot in the eye, permanently blinding him. Anderson spent the rest of his days sitting outside cowtown saloons, with his hat in his hands and begging for coins. Serafin Aragon – A member of Jesse Evans Gang during New Mexico’s Lincoln County War. Nothing is known of his life following the conflict. “Arkansas Bill” – A gunfighter in Dodge City, Kansas in the late 1870s who claimed to have killed twenty-two men. “Arizona Jack” – A gunman and teamster, was lynched at Wagon Bed Springs, Kansas Territory, for shooting to death another teamster. Ira Aten (1862–1953) – Aten joined the Texas Rangers in 1883, and became captain of Company D and later tracked and shot down outlaw Judd Roberts, an associate of Butch Cassidy’s Hole-in-the-Wall gang. he served as a sheriff in Fort Bend County, Texas during the Jaybird-Woodpecker War and later the sheriff of Castro County, Texas.